For the first five quarters of the program, students live in proximity to the North Cascades Environmental Learning Center, located in North Cascades National Park on the shores of Diablo Lake. The Learning Center opened in 2005 and serves as the residential campus for North Cascades Institute. It features guest lodges, a library, classrooms, computer lounge, an administrative building and a dining hall. Hiking trails connect the campus with over a million acres of public lands of the North Cascades mountains. In the living classroom of the North Cascades, students act as professional instructors for a variety of Institute programs, including Mountain School, our award-winning program for elementary school students. Graduate students explore all aspects of curriculum design while working with schools to meet grade level learning standards. 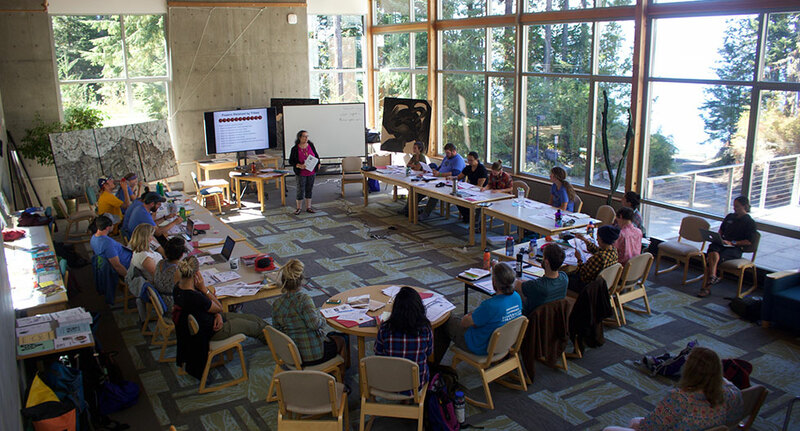 In addition, students undertake many responsibilities under the supervision of North Cascades Institute faculty and staff – from planning and teaching programs to nonprofit operations, risk management, and marketing and community relations. During the year-long residency program at the North Cascades Institute, graduate students are immersed in varied hands-on learning and professional experiences. Through a one-course-at-a-time model, students dive deep into course content while simultaneously gaining practical experience as educators and nonprofit leaders. Throughout the residency, students participate in field intensives, project-based learning, practical teaching and nonprofit administration experiences, and leadership development and trainings. 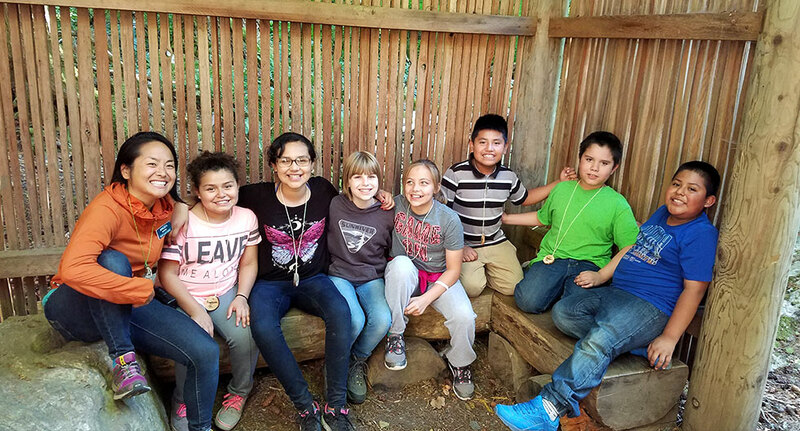 In doing so, students collaborate with many of the Northwest's best educators, naturalists and nonprofit leaders. 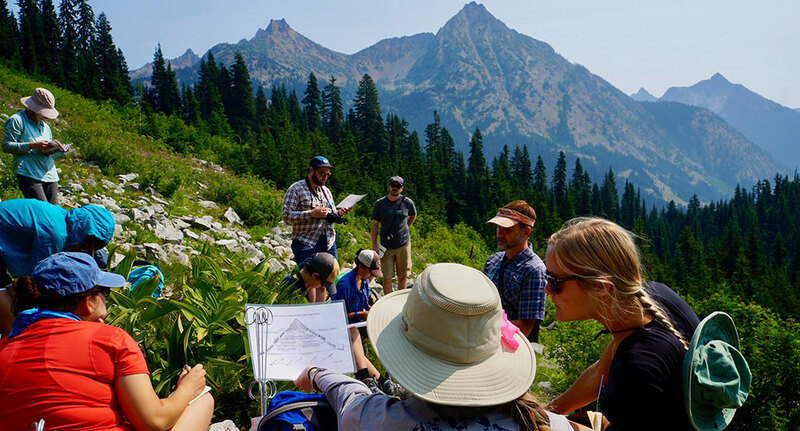 Students get to know their new home by engaging with the natural and cultural history of the North Cascades through field excursions across the region. 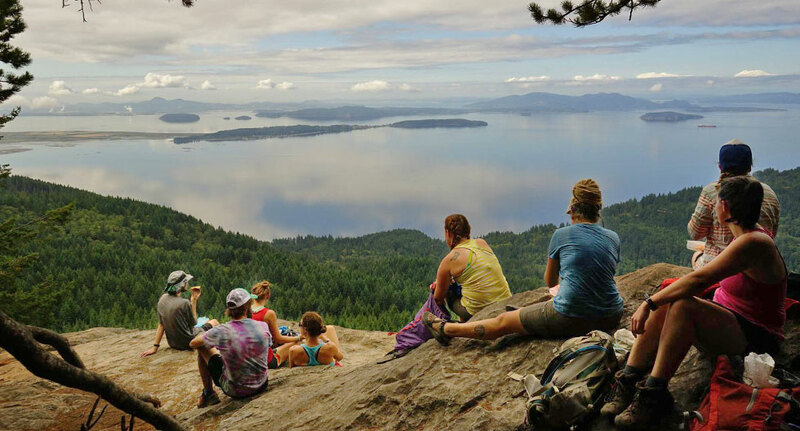 This intensive six-week course includes canoeing on the Skagit River, learning about local communities and sustainable agriculture, hiking in alpine areas, cohort community formation and a culminating 10-day backcountry experience. Grow as a naturalist and pursue a specific Pacific Northwest natural history research project. Explore the natural world with knowledgeable experts through a series of natural history intensives meant to spark curiosity, provide a foundation of naturalist skills and enhance your knowledge of the surrounding landscapes. Delve into the foundational theories and practices of environmental education through the Environmental Education Foundations course. Students focus on a systems thinking approach to social change and begin understanding themselves as educators through the practice of Transformative Inquiry. Prepare for the Spring Teaching Practicum with a greater understanding of curriculum design principles and teaching pedagogies. Develop your personal teaching philosophy through critique and analysis of informal environmental education programming. In practicum, students take their teaching to the next level with 330 contact hours of training and experience teaching our Mountain School Program. Put theory into practice in this unpaid teaching position by creatively implementing curriculum and learning how to effectively manage groups of students outdoors. Receive constructive feedback and support from instructional experts. 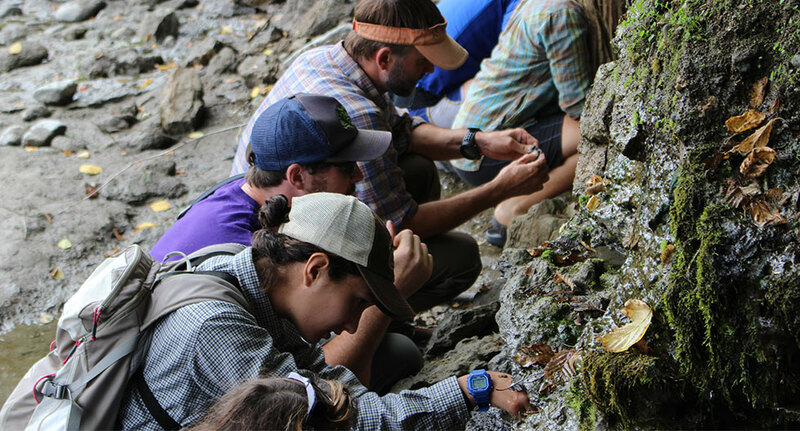 Graduate students focus on understanding and expanding their identities as educators while engaging in critical discussions about creating culturally relevant and memorable learning experiences for the next generation of environmental stewards. In partial fulfillment of the Certificate in Leadership & Nonprofit Administration, students are selected for an unpaid Leadership Track where they will dive deep in one program area and develop their leadership praxis. Leadership Tracks include facilitating wilderness expeditions for high school youth with North Cascades Institute's Youth Leadership Adventures; implementing intergenerational educational programs at North Cascades Institute's Environmental Learning Center; and collaborating with North Cascades National Park in areas of interpretation, restoration and conservation. 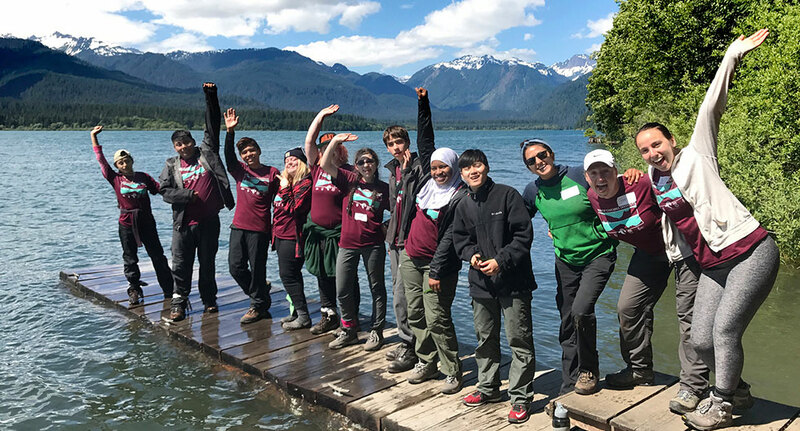 During this second summer of the Residency, students also serve in a support capacity for a wide variety of programs happening at the Environmental Learning Center and get an insider's look at the logistics, hospitality, and risk management that goes into serving diverse groups in a remote setting. Moving to Bellingham, students connect their residency experience through two quarters in the classroom at Western Washington University. Courses include Leadership and Nonprofit Administration, Equity and Justice in Environmental Education, and Assessment, Evaluation and Research and culminates in a Capstone project focusing on a personal area of inquiry. Celebrate your accomplishments with family and friends at an intimate graduation ceremony hosted at the North Cascades Environmental Learning Center! For the final months of the program, students move to Bellingham to connect their residency experience with the educational theory that supports it through two quarters in the classroom at Western Washington University. Courses include social justice and equity in environmental education, conservation psychology, and research, assessment and evaluation and culminates in a Capstone project focusing on a personal area of inquiry. Western Washington University is the highest-ranked public master’s-granting university in the Pacific Northwest according to recent college rankings from U.S. News and World Report, was named a Top 50 university offering “outstanding value with a first-class education” by Kiplinger’s Personal Finance and ranked in the top 50 of Sierra Magazine’s Coolest Schools! Above Bellingham - 4K Drone Film from Kjell Redal on Vimeo. Bellingham is located at the nexus of some of the Pacific Northwest’s most stunning and recreation-friendly regions. To the east looms Mount Baker and the Cascade Mountain Range. To the west are Bellingham Bay, the Puget Sound, and the glorious green mottle of the San Juan Islands. And everywhere in between are lakes, rivers, beaches, and trails."